Although there is some fun to be had at the beginning, once Maciste and crew are captured and taken underground there just isn’t a lot for the movie to do. We get a lot of escaping and capturing, some torture and executions, but it all takes place in cramped caves among waves of identical looking villains. 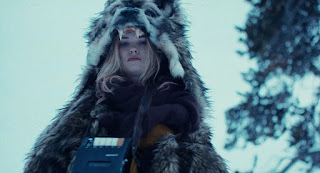 One of the big strengths of peplum films is their spectacle, and there isn't much of that here. 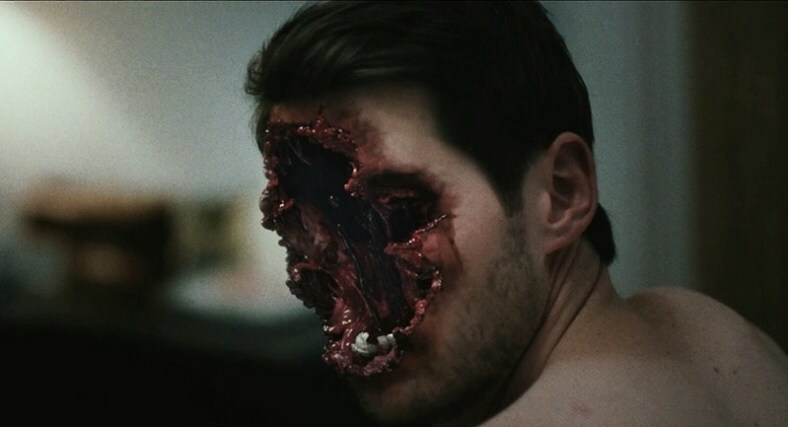 This movie attempts to go over-the-top during the climax but it feels too late to save such a sluggish story. There is also the inevitable love story (or two) but nothing that manages to generate much interest. He wanted his forehead to look really surprised. 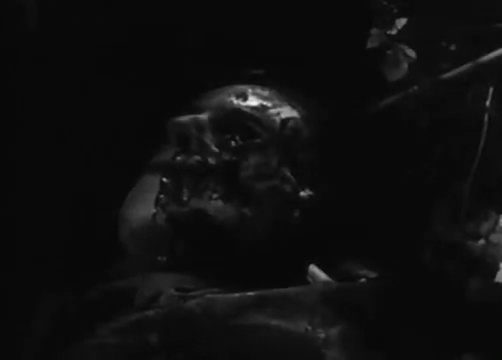 Although the movie does liven-up considerably during the climax everything feels very rushed. There is a mass jailbreak that leads to a lot of running around the caves. 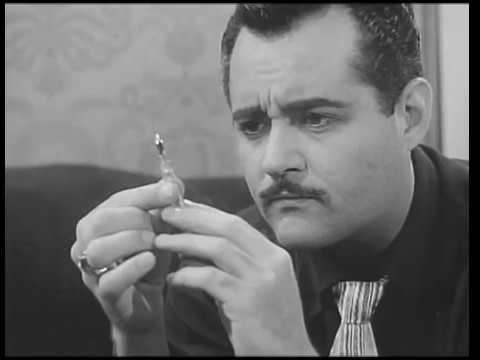 Maciste is pushing a giant wheel that does… something? Eventually, he and Bangor use the wheel and some chains to bring the whole Mole Man kingdom crashing down, but the fate of the Mole Men is never addressed. Just when the story seems to be wrapping up, someone walks off a cliff in a scene that is supposed to be tragic but heads straight into bathos. One place where Mole Men Against the Son of Hercules does succeed is in the goofy costume department. The Mole Men are outfitted with white skin, gold eye-masks complete with horns, and 1980s-worthy feathered hair. 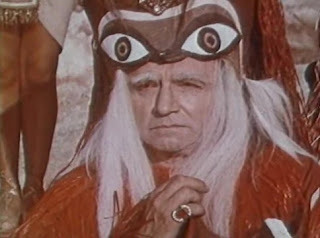 The cult leader Kahab (Enrico Glori) sports a huge hat complete with giant eyes on the front. 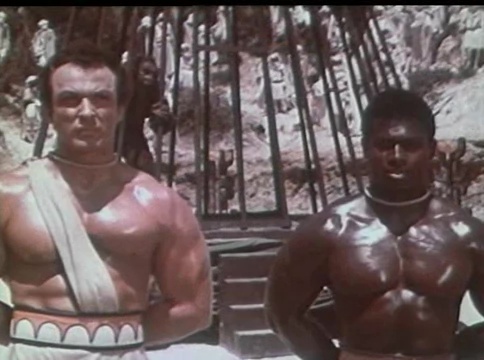 Maciste and his pal Bangor are probably wearing more body oil than actual clothing, but I suppose that is to be expected in a muscle man movie. Chests greased and ready for action. A number of actors have stepped into the role of Maciste since 1914, so how does Mark Forest stack up against the rest? He’s affable without being arrogant. He does manage to give a virtually indestructible hero just a little bit of a vulnerable edge, or least as much as you can within the limited confines of this subgenre. His companion Bangor is more problematic, he’s black and portrayed as plenty dumb and eager to serve Maciste. He does, however, have a much more compelling romance subplot that is given almost equal weight to Queen Mosab's love triangle. There are certainly better peplum films out there. 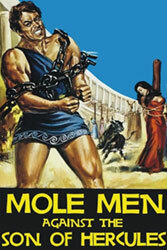 I suppose if you have exhausted all the more obvious choices (Hercules (1957), Hercules in the Haunted World (1961), Hercules (1983) to name a few), Mole Men Against the Son of Hercules isn’t an awful choice, it’s just an aggressively mediocre one. Jane (Marina Giulia Cavalli) and Lee (Robert Marius) sneak on to a remote island in hopes of exposing the illegal pollution disposal going on there. 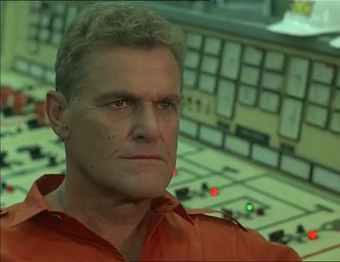 Colonel Kovacs (Charles Napier) runs the operation and is not too happy having do-gooders sneaking around. 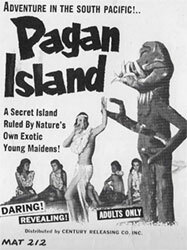 Elsewhere on the island is a venom expert named Bob (Daniel Bosch). 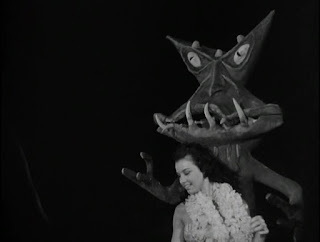 Everyone’s plans go straight to hell when an alien shows up eager to get its giant claw on some yummy toxic waste. First, off the alien isn’t exactly from the deep, it just sorts of lands there briefly before tunneling around under the ground. 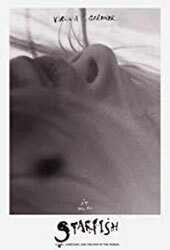 This is an Italian SF film from the 1980s, so, it is less about title accuracy and more about getting butts in seats by drawing upon other popular movies. 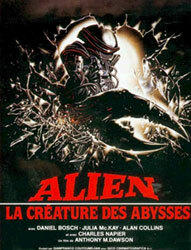 1989 saw no less than four deep-sea themed science-fiction movies, The Abyss, Deep Star Six, Leviathan, and Lords of the Deep. It is small wonder that the man who brought us Yor, Hunter from the Future (1983) and Killer Fish (1979) would want a piece of that action, even though this outing has more in common with Alien 2: On Earth (1980) than any ocean-related alien movie. "I wore this orange shirt to cheer myself up and it is not working." 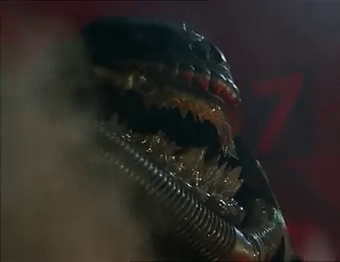 The first two-thirds of Alien from the Deep is basically an action movie centering around exposing a toxic waste disposal operation in a volcano. The alien finally makes its presence known by an almost completely off-screen crash into a nearby lake. At this point, things start to take a more familiar turn as everyone tries to accomplish their goals while the monster is lurking about grabbing people. I think it would be easy to view this genre switch as some kind of incompetent scripting, but it feels more like it is meant to mimic the sudden turn in Predator (1987) which also features an unseen alien menace interrupting the action. Charles Napier as Colonel Kovacks steals the movie. Kovacks is a huge jerk, he’s nasty to his underlings, brutal, and determined. Yet, by the time he reaches the finale, he is revealed to be a character who isn’t wholly without honor. He is just driven to do his job at all costs and is pretty ruthless about it. I’m not entirely certain what his plan is during his final stand-off with the monster, but neither is he, since he just stands there and shoots at it until it kills him. Somebody is smiling at least. The alien shows some obvious H.R. Giger influences, but it still is a pretty unique creature. Most of the time it is glimpsed as a single giant claw until the finale when we see the whole ropy beast. Kudos to the special effects department for actually building a giant claw to knock people around. The fact that a single touch from the alien can infect people and melt them makes it an even more horrifying threat. There are a number of miniature effects throughout the film to various degrees of success, but the best moments are the ones featuring the alien battling a couple of bulldozers. There is nothing particularly brilliant or original happening in Alien from the Deep, but it manages to keep things interesting with its weightless gory fun. Dr. Steve Karnes (Gene Evens) explains to a gathering of scientists in London, that marine life is experiencing unknown and dangerous changes from atomic bomb radiation. He’s proven right when a fisherman in Cornwall is found badly burned and utters the word ‘Behemoth’ before dying. Soon enough something big and highly radioactive is heading towards the Thames to die and it is going to take a lot of people with it. Karnes needs to figure out a way to kill the Behemoth without bombs or else it could spread lethal radiation all over London. The director, Eugène Lourié was also the writer of Beast from 20,000 Fathoms (1953). Behemoth is virtually a carbon copy right down to exact situations and characters. Lourié is also the director of the British giant monster film, Gorgo (1961) and you can see the parallels to that story as well. Lourié either really liked giant monsters or he really had a beef with London for some reason. The stop-motion animation is serviceable enough to not negatively impact the story, but it lacks Beast from 20,000 Fathom’s craftsmanship courtesy of Ray Harryhausen. Behemoth also runs a scant 71 minutes and saves most of its monster action for the end. "Phew, is it hot in here or is it just my radiation ravaged body?" The most surprising thing about The Giant Behemoth is that it is quite brutal by 1958 monster movie standards, dogs die, children die, old men slowly succumb to painful radiation burns, and wacky side characters find their helicopters exploding. Along with the expected property destruction, whole crowds of people are wiped out by radiation pulses. For all it’s cloning of Beast from 20,000 Fathoms, The Giant Behemoth manages to up the ante in the graphic violence department. It lacks a really iconic scene like Beast’s cop getting chomped but it makes up for that by sheer volume. 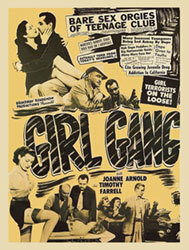 The beginning and closing of The Giant Behemoth are more promising and interesting than the main action of the film. The opening is a monologue from Dr. Karnes about the uncontrollable effects of radiation on life. It’s plotted out in a step by step manner that leads us from the realistic to the fantastic and it is a chilling journey. The original concept of The Giant Behemoth was to be a massive radioactive blob, and you can see the seeds of that idea planted in this opening. 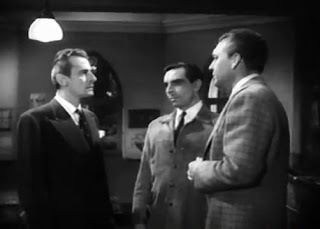 (A British giant radioactive blob movie had already appeared in the form of X: The Unknown (1956) from Hammer Studios just a couple of years prior.) The Giant Behemoth also closes on an apocalyptic note that keeps it from going out with a whimper. "Giant Behemoth" just seems redundant. 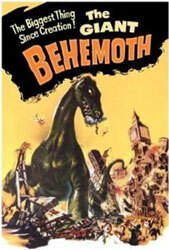 The Giant Behemoth isn’t a bad film, it is just one that looks much worse by cloning a great film. It retains a mean-spiritedness that is refreshing in the occasionally sanitized horror of the 1950s, but it remains a minor entry at best. It does have a few sparks of interest here and there but they are few and far between. 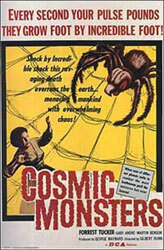 If you really like giant monster movies, I think you will be find enough to enjoy it.